Golf Equipment-Golf Club Sets. If you are a beginner wanting to find out about the game of golf or you are coming on holiday to Ireland it may be useful to know what are the different types of golf club. What is the best golf club set will depend on your own circumstances and it always good to hear from someone like your golf club professional to hear what may begin to suit you. Here are the different types of golf clubs within the golfing set. In terms of golf equipment woods are long-distance clubs used to extract the greatest golf club length and meant to drive the ball a great distance down the fairway towards the hole. 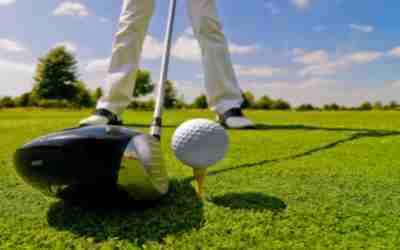 They generally have the largest golf club heads and a long golf club shaft for maximum club speed. Even though most "woods" are made from different metals, they are still called 'woods' to denote the general shape and their intended use on the golf course. Most woods made today have a graphite golf club shaft and a titanium, composite, or steel head. 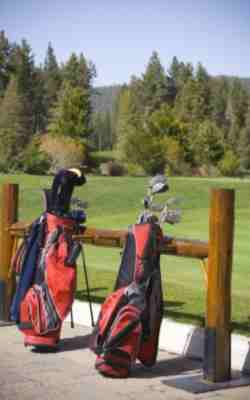 Golf Club Iron Sets are the most versatile class in golf club equipment and are used for a variety of shots. Golf Club Irons are designed for a variety of shots from all over the course, from the tee box on short or dog-legged holes, to the fairway or rough on approach to the green, to tricky situations like punching through or lobbing over trees, getting out of hazards, or hitting from tight lies requiring a compact swing. Most of the golf club iron sets have a number from 1 to 10 (the numbers in most common use are from 3 to 9), corresponding to their relative loft angle. For example a lower golf club loft will mean a lower number (for example 3 iron) and this will get you much further than say a higher lofted number 9 iron. Golf Club Hybrids that combine design elements of woods and golf club irons are becoming increasingly popular. Golf Club Hybrids are a cross between a wood and an iron, giving these clubs the wood's long distance and higher launch, with the iron's familiar swing. The head is usually smaller than true woods, however, not extending as far back from the face, and the lie and shaft length are similar to an iron giving similar swing mechanics. These clubs generally replace low-numbered irons in golf club sets for men and ladies (between 2-5, most commonly 3-4), which are typically the hardest clubs in a player's bag to hit well! Golf Club Wedges have greater golf club loft than the numbered irons (generally starting at 45° loft), that allow for easier use in tricky lies. Wedges are used for a variety of short-distance, high-altitude, high-accuracy shots, such as approach shots hitting the ball onto the green, or chipping the ball out of hazards or rough onto the green. There are five types of golf club wedges, with golf club loft ranging from 45° to 64°: pitching wedge, gap wedge , sand wedge , lob wedge , and ultra lob wedge. You can get a golf club set with a chipper. This is a club designed to feel like a putter but with a more lofted face, used with a putting motion to lift the ball out of the higher grass of the rough and fringe and drop it on the green, where it will then roll like a putt. Most chipper golf clubs have a golf club loft greater than 10 degrees, which is the maximum loft permitted by the Rules of Golf for a club to be classed as a putter. These are used mainly on the green to roll the ball into the cup. Golf Club Putters are a special class of clubs with a golf club loft not exceeding ten degrees, designed primarily to roll the ball along the grass, generally from a point on the putting green towards the cup. Contrary to popular belief, putters do have a loft! A Standard set consists of 14 golf clubs, and while there are traditional combinations sold at retail as matched sets, players are free to bring any combination of 14 or fewer legal clubs. The golf club loft or the angle between the club's face and the vertical plane. It is golf club loft that is the primary determinant of the ascending trajectory of the golf ball. The impact of the club compresses the ball, while grooves on the clubface give the ball backspin. Together, the compression and backspin create lift. The majority of golf club woods and irons are labeled with a number; higher numbers indicate shorter shafts and higher lofts, which give the ball a higher and shorter trajectory. So that is a quick tour of golf club parts and golf club equipment that we hope you found useful.